MAREK took on a new challenge in conjunction with Hunt Construction Group, Way Engineering, and Walker Engineering: Construction POD Prefabrication. MAREK was contracted to complete framing, drywall, acoustical ceilings, and wall panels for the Methodist Hospital System’s North Campus expansion at the Texas Medical Center. The project consisted of an 11-level bed tower and 28,000 square feet of renovations. The general idea of POD construction is to build modular units offsite (and prior to the building being constructed) and have them shipped and installed into the building. The process allows for time savings in the overall schedule and a streamlined construction effort resulting in minimal issues and a higher quality product. In the specific instance of the Methodist North Tower Expansion Project, two types of bathroom PODs were prefabricated: Acute Care (180) and ICU (39) patient room units. MAREK worked in an offsite warehouse prefabricating BIM-coordinated (and BIM-designed) bathroom units and headwall assemblies for the patient bed tower. Through successfully building and installing these prefab PODs, the MAREK team was able to compress the project schedule by performing multiple activities in parallel. Saving time isn’t the only benefit from prefab PODs – the potential for improved quality, better safety metrics and less waste are just a few added benefits. Collaboration, coordination, and attention to detail from the entire team was essential in managing this process. The coordination of the units was extremely critical between all trades because of the mass amount of prefabricated parts and materials that are made in order to streamline the construction sequence. In order to accomplish the proper coordination, the use of Building Information Modeling (BIM) was utilized. 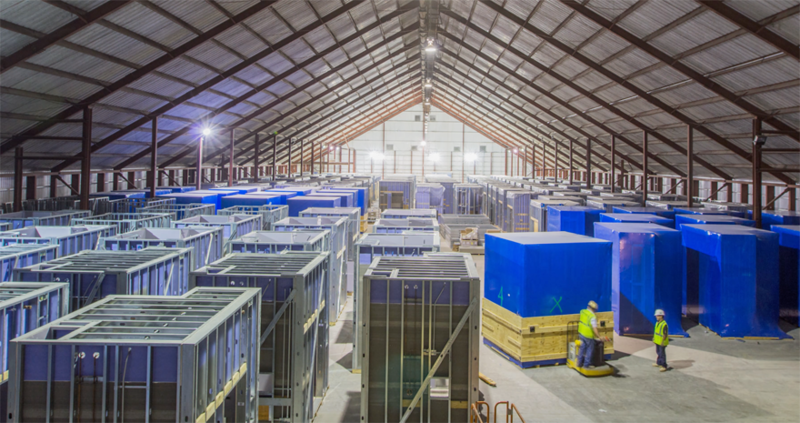 The BIM process started long before mobilization to the prefab warehouse in order to detect any major clashes or issues that any of the trades had with each other. As soon as coordination was signed off and complete, shop drawings were created based on the coordinated model. Prototypes of both types of PODs were created to ensure all the coordination was complete. Shop drawings were then sent to Industrial Steel Fabricators (ISF) who specialize in creating pre-punched/drilled studs based on the exact layout of the coordinated room. This is another step that allowed for simple, quick framing and construction. At this point material could be fabricated and delivered and construction could begin. After models were coordinated, shops were approved, and materials were ordered and delivered, mass production began. Jig tables were built to accommodate for the different types of walls within the PODs. These jigs were marked in detail with proper stud spacing, blocking layout, and niche spacing. A specific sequence was established on the front end of the construction process and was tailored as needed. The specific trade tasks and the ideal time when those tasks could be completed dictated the final sequence. Check out the timelapse video below documenting the PODs from the warehouse to delivery at the jobsite.